Pruning small trees is not difficult, but it does require care and knowledge. There are many reasons to prune trees, including: to trim away dead or dying branches, to provide healthier air circulation among the branches, to keep them clear of obstacles or buildings and to highlight their natural beauty. Although most trees can be pruned at any time when it’s necessary, late winter is the time I recommend, before the tree needs to use its energy for growing. Also, for deciduous trees, you get a better look at the tree structure without leaves. Before you pick up the pruning saw, take a good look at the structure of the branches. If you see branches rubbing together or crossing, one should be pruned away. Are there dead branches that need to be removed? Are there signs of disease? The timing of pruning sometimes depends on the purpose of your tree. For example, if you intend to harvest fruit from your apple or pear tree, pruning after the fruit is harvested is recommended. If the fruit tree is ornamental, pruning in winter or after flowering is fine. The first rule of pruning trees is safety. If you need to climb a ladder, make sure that it is firmly situated. For small trees, a pruning saw and loppers should meet your needs. Don’t use a chainsaw, unless you have safety training. The same goes for climbing. Any reputable tree care company (such as Almstead), requires many hours of training and certification before we let our crews perform this kind of work. 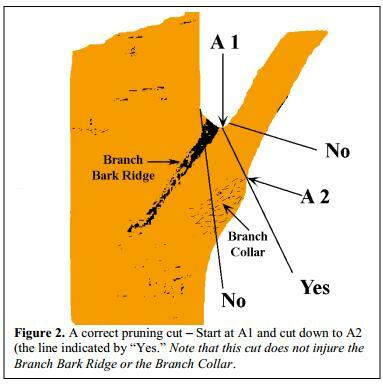 When pruning tree limbs close to the trunk (as opposed to outer branches that are pruned back to a fork or a lateral bud), it’s important to understand the role of the branch collar. The branch collar is the junction where the branch meets the trunk; it is a swollen ring around the bottom of the branch that looks more like the tree trunk than the branch. Never prune the branch flush with the trunk: you should leave the branch collar intact. Ideally the pruning cut is made just beyond the branch collar. If you’re in doubt, leaving extra branch is better than damaging the collar. The reason for this careful treatment of the branch collar is to help the trees heal themselves. Trees have the ability to compartmentalize damage. The branch collar will seal off the wound made by pruning; if the cut was made correctly, in a couple of years, the wound will be healed. It used to be common to paint something over these wounds to seal them; now we realize that the tree will do the job better if left alone.